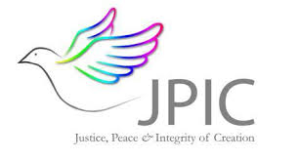 The Role of the Justice, Peace and the Integrity of Creation ie the JPIC Committee of the Diocese of Kerry is to raise awareness of Catholic Social Teaching. Key Principles of Catholic Social Teaching. We do this in three ways: by encouraging action, by providing resources and building networks. We also have an advisory role to the bishop. 1st September 2018: World Day of Prayer for the Care of Creation (Service in Tralee Town Park). 1st September – 4 October 2018: ‘Creation Time’, series of events. Inspired by the Gospel, the Diocese of Kerry Justice, Peace and the Integrity of Creation Committee promotes Catholic Social Teaching by encouraging action, providing resources and building networks to create a more just world (2015). Fr. Ger Godley, Michael McEgan, Sr. Aileen Murphy, Sr Maureen O Connell, Evelyn o Sullivan, Mike Riordan and Sylvia Thompson.